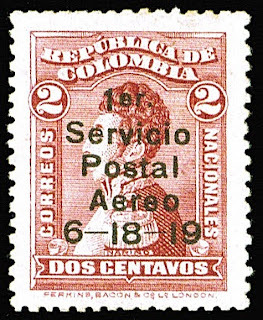 In 1919 and '20, Colombia issued its first airmail stamps, the first eleven of which (C1, C2-10) are extremely scarce. C1, of which 200 were issued, was intended for an experimental flight from Baranquilla to Puerto Colombia. 160 were used, and many of the stamps which remain are defective. 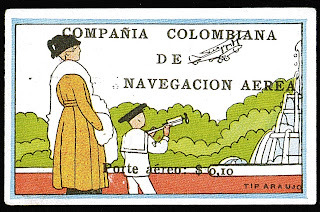 C2-10, produced by the Compania Colombiana de Navegacion Aerea, incorporated Art Deco-style designs illustrating various flight motifs, and only 100 of each of these stamps was issued. $2,750.- and $5,500.- with the exception of C7 ($ 10,000.- for unused). Purchase of any of these stamps should be made conditional on expertization. Despite their apparent priciness, they are all grossly undervalued, especially given the prospects for growth in the Latin American stamp market in general, and Colombia's in particular. 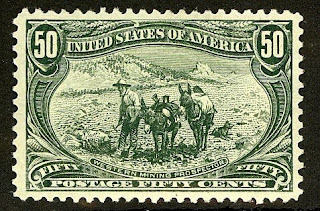 They are each at least as rare as the U.S. Inverted Jenny stamp, but may be had for 1% or less of its price. A nation of 45 million people, Colombia has been plagued by decades of serious internal armed conflict, drug trafficking, corruption, and gross inequities of income, but has nevertheless racked up impressive annual GDP growth averaging 5.5% over the last 5 years. Moreover, until the global financial fiasco cut its GDP growth to 3% in 2009, it had been steadily accelerating, from 2% in 2003 to 8% in 2008. Recently, the government, armed to the teeth by the U.S., has applied a dual policy of combining military pressure with negotiations to cope with the various guerrilla factions within the country. This seems to have worked to some extent, as the number of insurgents has been halved, and the number of homicides and kidnappings drastically reduced. While some argue that the Colombian government is still utterly corrupt, and has violated human rights and supported paramilitary death squads in order to achieve relative peace, it may be that this is par for the course, given the nation's history. The main challenge that the country faces will be that of sharing more of the wealth with the majority of the population so as to develop more of a middle class and political center. Otherwise, it will devolve into an unstable mess.